We understand the weather on Earth. The Sun heats the air at the equator, causing it to rise. The warm air goes to the poles, cools down and sinks, and then circulates back. Scientists call this Hadley Circulation. 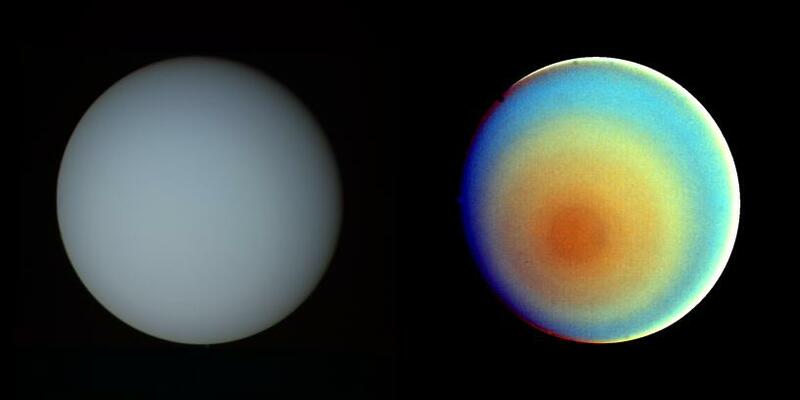 The weather on Uranus works very differently. This is because Uranus is tilted over onto its side, rotating at an angle of 99-degrees. Over the course of its 84-year orbit, the north pole of Uranus is facing towards the Sun, and the south pole is in total darkness. And then the situation reverses for the rest of the planet’s journey around the Sun. Instead of heating the clouds at the equator, the Sun heats up one pole, and then the other. You would expect the pole facing the Sun to warm up, and to have air currents move towards the other pole. But this isn’t what happens. The weather on Uranus follows an identical pattern to what we see on Jupiter and Saturn. The weather systems are broken up into bands that rotate around the planet. While Uranus has a completely different tilt from Jupiter and Saturn, it does have internal heat rising up from within. It appears that this internal heat plays a much bigger role in creating the planet’s weather system than the heat from the Sun. Although less than Jupiter and Saturn, the wind speeds on Uranus can reach 900 km/hour, and seem to be changing as the planet approaches its equinox – when the rings are seen edge on. We have written many articles about the weather on Uranus for Universe Today. Here’s one that talks about how stormy the planet can get. And here’s one about the discovery of a dark spot in the clouds on Uranus.